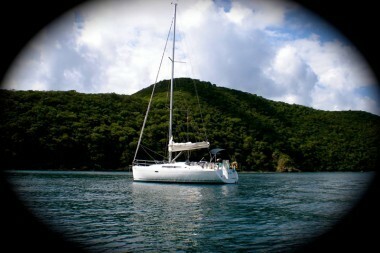 $2,395 per week Off Season: 10th July - 5th November. 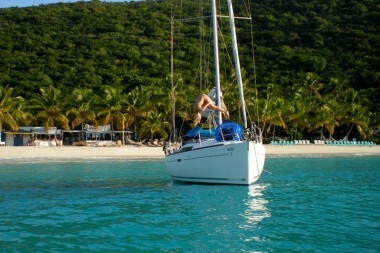 $2,600 per week Low Season: 1st May - 9th July and 6th Nov - 15th Dec.
$2,950 per week Mid Season: 2nd Jan - 31st Jan and 1st April - 30th April. 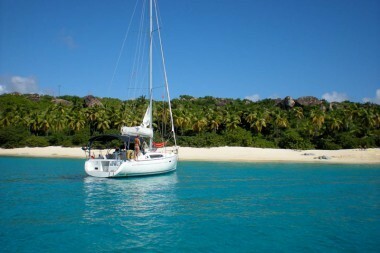 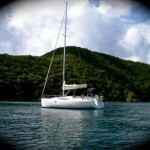 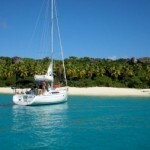 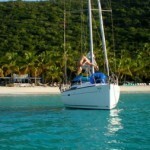 $3,400 per week High Season: 16th Dec - 1st Jan and 1st Feb - 31st March. 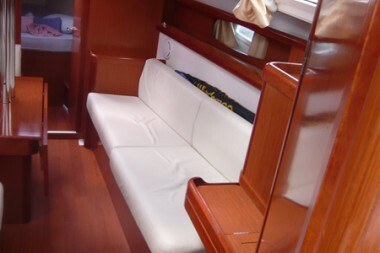 The Beneteau 37 is elegant and well thought out with a contemporary below decks interior by Nauta Design and dynamic external lines by Groupe Finot Conq. 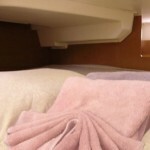 Access down below is via Beneteaus innovative new drop and slide, companion way door system. 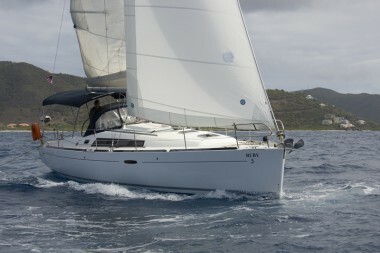 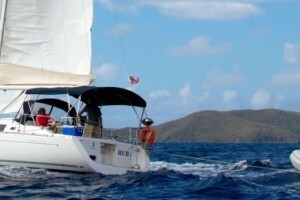 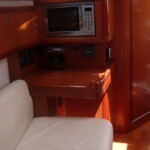 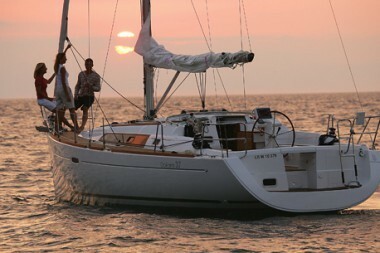 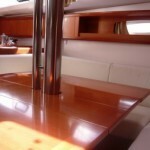 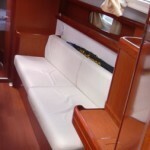 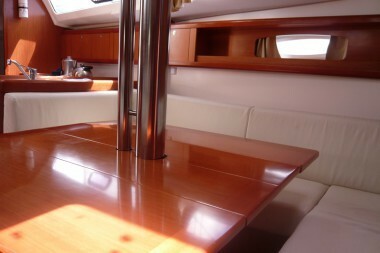 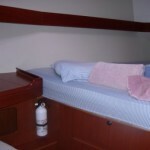 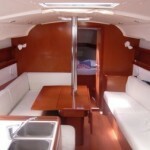 The companionway itself offers a secure descent from the cockpit to the galley, where the counter and its robust fiddle rails provide further support. 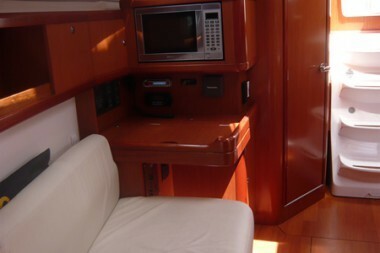 The galley is well equipped with 12V stand up refrigerator with a freezer compartment in the top and ample freshwater and stowage capacity. 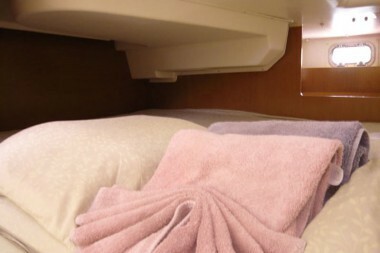 The front-opening refrigerator that leaves the countertop intact, mean you have plenty of counterspace. 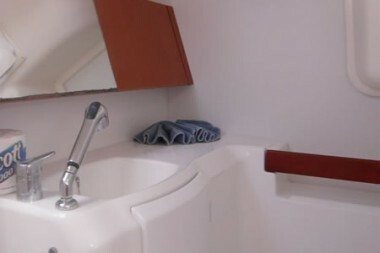 The centerline double sinks are functional both for their intended purpose and as a handy, secure repository for items in transit to or from the cockpit. 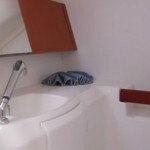 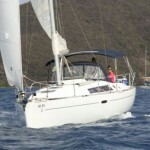 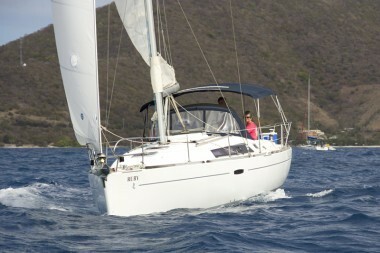 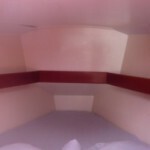 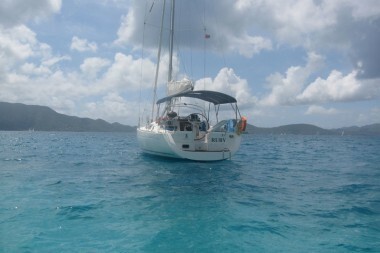 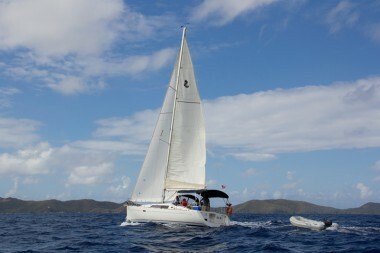 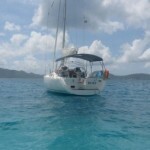 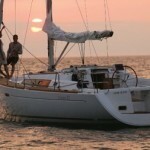 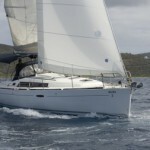 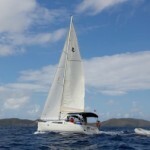 To starboard you will find the all-in-one head and shower compartment. 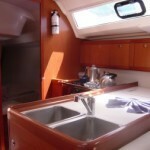 Slanted mirror-front cabinets outboard above the sink, give plenty of space for washing & shaving. 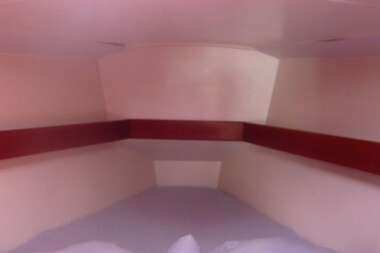 The chart desk, located forward of the head, has nooks and crannies to hold the navigator’s tools and fascia area for radios and instruments. 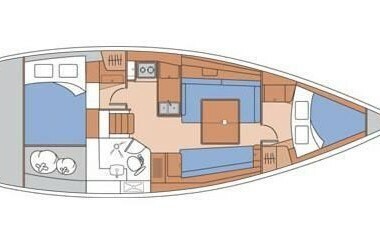 The styling in the saloon marks the return of ergonomic functionality-in the Beneteau 37, settees with square corners invite sitting and reclining in multiple comfortable postures and attitudes. 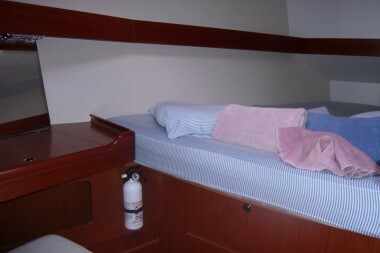 Forward, the V-berth cabin has generous standing room, a small dresser, a spacious berth, and, given the hanging locker, drawers, shelves, and shoulder-level cabinets, a variety of stowage options. 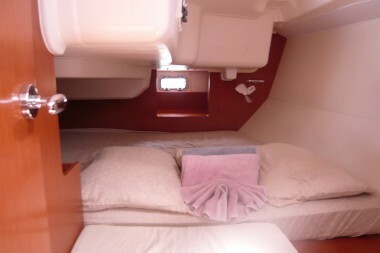 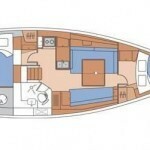 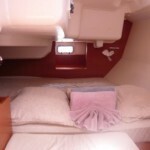 The aft sleeping cabin has a generous athwartships berth with sitting headroom at its head, decent dressing room, and three opening ports, one of them located in the transom. 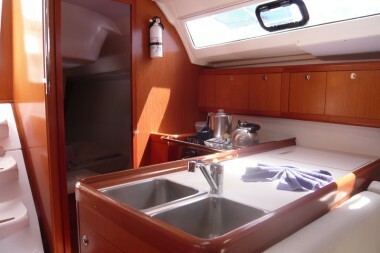 A space between the aft bulkhead and the transom creates an extra stowage. 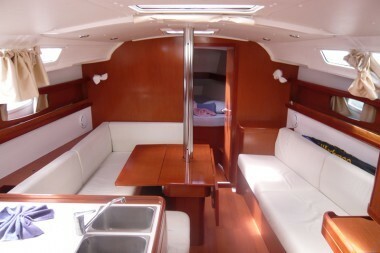 The cockpit is vast and a family of four can sit side by side on the helm bench, the center section of which hinges open, held by a gas strut, to provide access to the transom platform.